"A modern day fable of awakening and rebirth about “the boy who can fly” and a whale shark who is his guide and muse. This fable is a metaphor for humankind to heed the knowing voice that guides each person to live their best life. This act of trust transmutes a person’s shadow side, harnesses their creative power and unleashes a force that raises consciousness both individually and collectively. "Suitable for all ages, The Man and The Shark provides beautiful images of nature, animals, and paintings that touch the heart as a journey of a man is portrayed. Many readers will recognize their own story through the passages of coming into the world, knowing truth ...growing through life, making choices and forgetting the essence within ...finally to find the solace and remembrance. For those that tend to resist that voice from within, there will be a resonance to the words that unfold, allowing for a trust and knowing to once again dawn." 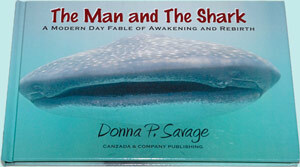 "The Man in Donna Savage’s remarkable fable, The Man and The Shark, is Every Man. It is, sadly, too true that it is the story of many individual men in contemporary society. It is the story of every man, everyone, who abandons the original sense of wonder and creative communication with animals and fish and trees, to fit in, who “outgrows” the magic and wonder of the mysterious depths of human life. The imaginative power that enables a “boy to fly” becomes dormant and life deadly serious. Reading this fable is a renewal of hope. At first, the solution to the psychological imprisonment of the Man seems too simple. Yet, listening to the Inner Voice and making the choice to recover the “lost boy who can fly” is the key. The significance of this fable is heightened by the powerful imagery of the author and by the moving, abundant photography of Daryl Ambress Pritchard.